Fluorescents retain colour underwater because their wavelengths are not common and they emit colour when stimulated by light of any shorter wavelength. Light – Made up of electromagnetic energy Water affects light through: The speed of light depends on the density of the medium it’s traveling through. The denser the medium, the slower the speed. Absorption: Absorbs the weakest wavelengths first i.e. red, orange, yellow, violet.. As less light is available the eye’s pupil opens up, resulting in less colour detail. Fluorescents can be seen underwater, why? Sound travels in waves with acoustical energy (a form of mechanical energy). Light can exist apart from matter, sound exists only within matter (cannot travel in vacuum i.e. space). Speed: Sound travels best in dense matter i.e. travels better in water (solids or liquids) than air (gas). Therefore as water temperature changes, so does the affect of sound travel. The bending of light is called REFRACTION. Water absorbs colour – RED disappears first. This can be used with any gas mix such as Helium, Nitrogen,Carbon Dioxide, etc. Air =21% Oxygen 79% Nitrogen (ALWAYS) This is important to be able to calculate the partial pressure of gases to any depth. Doing this you’ll be able to see when Oxygen reaches high levels that may cause oxygen toxicity. Therefore is an air mix has 0.2% carbon monoxide. Breathing it at 30m would be the equivalent of breathing what percent at the surface? E.g. If you shake a Coca-Cola bottle, you’re building up pressure inside the bottle, forcing gas into the cola. When you quickly open the bottle you decrease the pressure and all the gas comes out of the cola. THE BUBBLES! When the pressure (an amount) of gas that has been forced into a liquid is the same as the surrounding pressure (outside pressure). Like when shaking the Coca-cola bottle, you can shake it all you want until there is no more gas to be dissolved. It has reached an equal pressure so the pressure is therefore the same inside the bottle as the pressure outside the bottle. When the pressure becomes less, the same as when you open the Coca-Cola bottle, the gas that was dissolved into the liquid starts coming out of the liquid (out of solution). If it is controlled the bubbles come out slowly. However, if the pressure is released too fast, the bubbles will come out too fast as well. As the temperature increases (gets more) the volume of a flexible container will increase (get more) and the density (pressure) inside the container (non-flexible) will increase and if the container is flexible the density (pressure) will remain constant. The opposite happens when the temperature decreases (gets less). As the temperature decreases (gets less) the volume of a flexible container will decrease (get less) and the density (pressure) inside the container (non-flexible) will decrease (get less) the flexible containers density (pressure) will remain constant. Example if a tank is 200 Bar and on the boat in the sun at 40 Degrees Celsius, what pressure would the tank be if someone puts the tank on and jumps in the water which is 20 Degrees Celsius ? This level of understanding is normally not required but if you can understand this all the better, in general just remember .6 degrees for every 1 bar as in the above example. For every 1 deg C, change a scuba tank changes 0.6 bar. A gas occupies a volume of 20 L at a pressure of 5 atm and a temperature of 500K. What will the volume be if both the pressure is raised to 10 atm and temperature is changed to 250K? A gas occupies a volume of 20 L (V1) at a pressure of 5 atm (P1) and a temperature of 500K (T1). What will the volume (V2) be if both the pressure is raised to 10 atm (P2) and temperature is changed to 250K (T2)? (5 atm) (20 L) (250 K) / ( 10 atm) (500 K) = V2 = 5 L.
A gas occupies a volume of 200 litres at a pressure of 2 atm and a temperature of 300 K. What will be the volume if both the pressure is raised to 10 atm and the temperature is changed to 1000 K? (Note:- The exact answer is approx. 0.6% less). A 12 litre tank reaches 52 C while filling to 200 bar. The tank goes into water at 7 C. What will the tank pressure be? Ok but will this ever affect me ? in the diagram below you can seee that as depth increases the pressure (which is measured in bar increases. Therefore a diver at 30m, which is the depth a qualified open water dive can descent to, will be under 4 bar of pressure. The 4 bar comes from 1 bar from the weight of the atmosphere and the 3bar from the weight of the water above him. Boyle’s law deals with the relationship between pressure and volume. For the purposes of explanation and calculations we assume no changes in temperature. This states that for a fixed quantity of gas (at constant temperature) the volume of the gas is inversely proportional to the pressure of the gas. If you take a bucket with an internal volume of 1 litre and turn it upside down in the water, then take it down to a depth of 10 metres, because the ambient pressure at 10 metres depth is twice the pressure of the surface, the volume of air in the bucket reduces in volume by half to 1/2 a litre. Alternatively if you start at 10 metres depth and half fill the bucket with air, then ascend to the surface, the ambient pressure will be halved, so the volume inside the bucket will double, and fill up completely. Question: If the diagram was extended to 60m what would the air volume and pressure be? A flexible container with a volume of 35 Litres is at 28mfw (metres of fresh water), and is taken to the surface. What will the new volume of the container be? You take a gas volume of 27 litre from 32 m to 17 m in fresh water. What will the new volume be? So 27 litre x 4.10 = 110.7 at surface. So 27 x 4.2 = 113.4 / 2.7 = 42.0 litres at 17 m.
If you take a container filled with air up from a certain depth – the volume will increase (get bigger) and the air will become less dense (less pressure) You multiply (x) the volume when taking down. 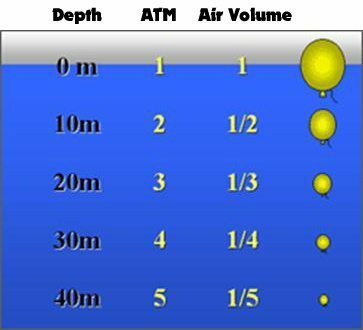 You divide (/) the volume when taking up If you have 2 different depths underwater. First calculate the volume at the surface, and then back down at new depth again. Example: You plan to recover a 150kg outboard motor in sea water that displaces 60 litres and lies at 30m. How much air must you put in a lifting device to make the motor neutrally buoyant? You must sink into fresh water an object that weighs 50kg and displaces 300 litres. How much lead weight must you affix to the object to make it 10kg negative on the bottom? Air becomes denser (more pressure) as you descend underwater. 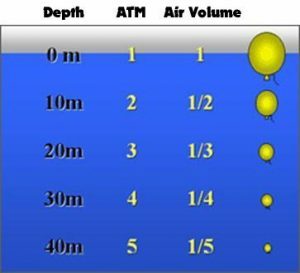 A diver will use more air due to increased (more) pressure. He’s going deeper…more pressure. A diver will use less air due to the decreased (less) pressure as he ascends. He’s going up… less pressure. E.g. A divers air consumption rate is 3 Bar per minute at the surface. What will the air density be at 30m compared to the surface, and what will the divers air consumption be? More Dive theory that I will get categorised shortly.